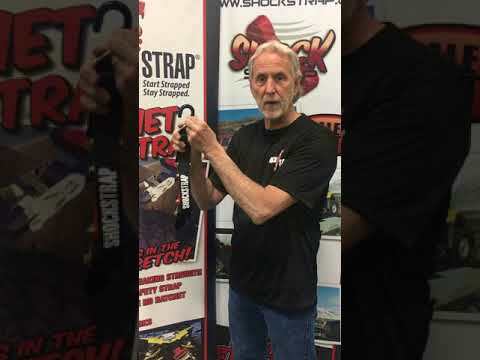 Although you probably own many straps, you still like the idea of having a ShockStrap added to your straps. Now you can take your old straps and convert them into ShockStraps. Converting your strap to a ShockStrap is easy. Start by attaching one side of your strap, then take the hook on the other end of your strap and insert it into an opening on one end of our Stand Alone strap. Once both hooks are secure, you can tighten your strap. Add tension until the ShockStrap is stretched and your strap is tight. Please realize we can’t control the type and strength of webbing or hook on your strap. If you find your load is still shifting, you may need to completely replace your old straps. Overall length from the hook to the opening is approximately 18”. If you lope the soft tie into the hook the approximate length is 23”.